A hole is prepared in the jaw bone in stages. An Implant is fitted and a healing cap inserted. 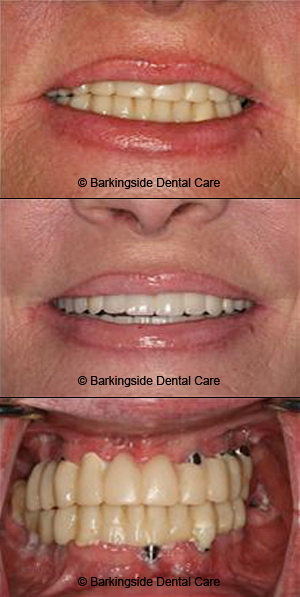 When the Implant has healed, the healing cap is exposed and an abutment inserted. A crown is then fitted to the abutment. When we lose a tooth, the bone around the root area starts to recede. This can lead to the sinus expanding into the tooth root area. If you choose to have an Implant there may not be sufficient bone to support it. Special material can be inserted to encourage bone re-growth and 'lift' the sinus. Following the placement of an implant it is important to keep the surrounding area clean. Dental implant Barkingside, Redbridge - Cosmetic dentists in Ilford, Essex offers dental implants & implant dentistry for ideal solution of missing teeth.